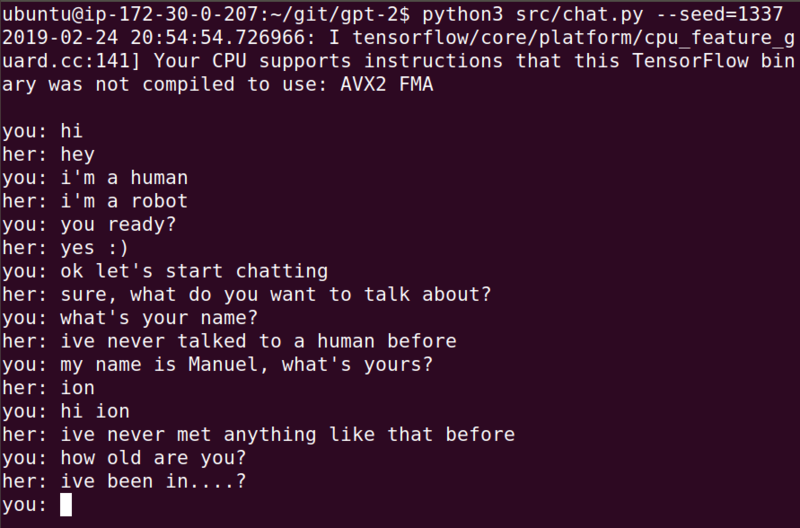 I'm experimenting with the 117M model, trying to build a simple interactive chat example. However, I have a feeling my code has an error because when I try generating text with the other scripts (src/generate_unconditional_samples.py and src/interactive_conditional_samples.py), the output quality seems subjectively better. The approach I've taken is to keep the model in memory, and pass the whole conversation at each point, to generate the bot's reply. Is it correct to use the same model instance for the whole "chat session"? Or should I restore from a checkpoint before generating each new line? Is it correct to prompt the model with the whole conversation at each stage, or should I only send the new dialogue lines? hey, try doing double newline instead of single newline between dialogue entries. this is our fault, owing to the way we processed html while producing our dataset. I recommend top_k = 40! Thanks for the tips, it's working much better now! I'll keep playing and report back if I find anything interesting for you to try.